Eventful is truly amazing to work with!!!! Amy and Rise are so attentive to your needs and have the most AMAZING selection of truly unique pieces to rent. I have had the pleasure of working with them on several occasions and have loved each and every second. Besides being super sweet ladies, Amy and Rise make sure to help you find the most perfect rentals! 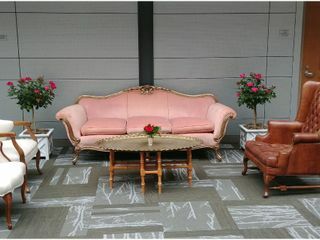 Who wants "cookie cutter" tables and chairs when you can have fun and funky, vintage or modern pieces for your event! Choosing these ladies will be a decision you won't regret!!! Amy and Rise are fantastic! They were so accommodating with me being an out of town bride and really made my vision come to life. I would highly recommend them to anyone getting married or needing decor for any type of event. You will not regret working with these ladies! Highly suggest Eventful! They worked around my busy schedule and made my save the date photos turn out perfect!!! 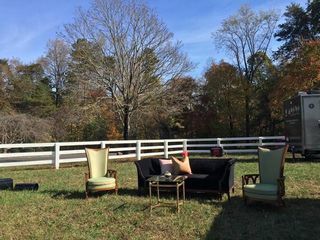 This company was a joy to work with, very responsive to requests, great inventory of furniture and exactly on time with delivery and pickup after our backyard wedding. 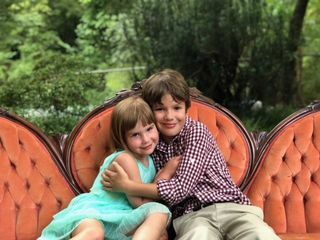 So many people commented on how wonderful the furniture was: we used it for the family to sit in at our daughter's wedding. It provided that intimate "family" atmosphere, and was just the "something different" we were looking for. Many thanks to Eventful for the wonderful service. Loved working with Rise and Eventful NC! They have so many beautiful decor items for reasonable pricing. Working with them was such an enjoyable experience as they are kind, professional, and organized. Couldn’t recommend more!! 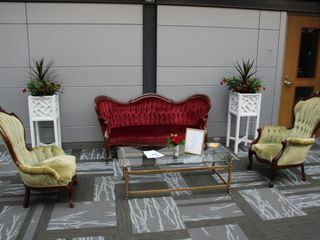 Eventful was professional, responsive and provided us with beautiful furniture for our outdoor wedding! 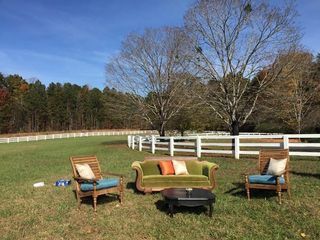 We loved using Eventful for our two vignettes at our annual Kentucky Derby Party! Will definitely be using again sometime and recommending them to others! We rented furniture and had such a wonderful experience. Highly recommend Eventful. So grateful. 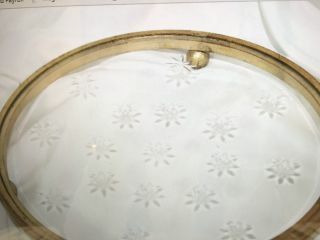 We were able to find a beautiful cake plate that was perfect for my daughter's wedding this past weekend. The customer service is unmatched and the price was very reasonable. Eventful was so helpful to us in planning our event! They assisted in picking out the perfect items that we needed to make the day a success. They have such a wonderful inventory of items to choose from and asked all the right questions. I would recommend them again and again. Risé and Amy are great to work with. They meet with you before hand to understand your vision and then work with you to select the perfect pieces from their collection. Very professional yet willing to be flexible for personal reasons. We used the cross for our centerpiece. It was beautiful and well worth the money to rent. Would highly recommend them to anyone looking to make their wedding or special event accented without spending a fortune on pieces you only need once. My experience with Eventful was great, as always! Not only are the pieces beautiful, but working with them is always a piece of cake. I'd highly recommend Eventful for not only furniture, but also for decor and tableware items! From the moment we met with Rise and Amy they were nothing but helpful and accommodating. I had a vision for my wedding that wasn’t cheap. They worked with me and gave me options so i would be able too afford what I wanted to do. I can’t thank them enough for going above and beyond to make my vision come true. They were following up, scheduling, and listening to what I was concerned about. When they heard of anything I needed that they could assist me with, they jumped in to help. I originally had only rented tables and was concerned about seating- they kindly added in many chairs so that I wouldn’t have to worry about that. I can’t be more honest when I say, these women are building thier business on the foundation of hard work and love. You can just see it in thier interactions and smiles. It’s not just a job it’s a passion. My husband and I thank Eventful for making our day that much more magical. Y’all did such an amazing job and y’all are the sweetest people ever!! Thanks again for working with me to make my husband’s and I️ wedding to look beautiful! 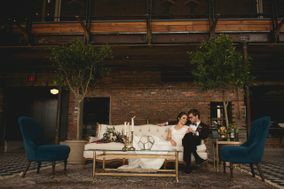 The rentals from Eventful made all the difference in the look & feel of my wedding. Their inventory is full of unique items. We were able to turn a plain venue into something spectacular! I would highly recommend them to anyone! Eventful is the Best! Amy and Rise are so helpful, creative, fun, and a pleasure to work with. Their inventory is amazing and great care is taken to insure that your wedding is exactly what you wished for. Or, in our case, beyond anything we could have imagined, Your search is over. Eventful is the place you are looking for! We used Eventful for a dinner meeting and they were wonderful! We needed table decorations and they came through in a big way! It was beautiful!! I highly recommend them!! Eventful was quick to get back in touch with me, and made the whole rental process easy! They were also very nice and accommodating with the times we met. I highly recommend them! Amy & Risé with Eventful NC are thorough, and have an eye for detail. 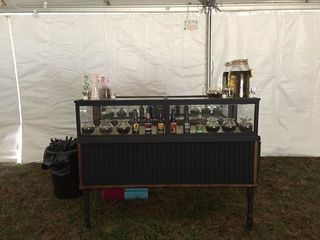 My clients are always pleased with the pieces they rent from Eventful NC. They know how to add those finishing touches to every event! Wonderful furniture that added so much charm to my daughter's wedding day! Great people to work with! Eventful NC has an extensive selection of inventory that I use for props for my photography business. I know I can always find what I need or what my clients are looking for at their shop. It is always so much fun to go in and see all of the inventory and how they have put pieces together. Amy and Rise' are so delightful to work with and will bend over backwards to accommodate your needs. They offer a wide range of styles and their great design style will help you mix and match items to match your vision. Their customer service is AMAZING. You will not find anyone more devoted to their customers and their business! I would highly recommend Amy and Rise' at Eventful NC for any of your rental needs! Eventful had the perfect pieces to go along with my whimsical vision! They were priced well (would have been awesome to have the rental prices on the site), had an awesome assortment and were very nice and great to work with. I really enjoyed the entire process with Eventful and will definitely be renting items from them for future events!!! You have to check out Eventful! It is awesome! There are so many beautiful items and pieces to make your event perfect. The location is very convenient and the staff is very helpful and friendly to work with.